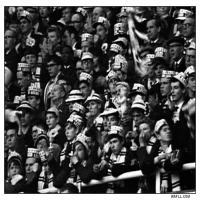 Leeds United fans first time at Wembley watching the Whites in their first FA Cup Final with Liverpool. 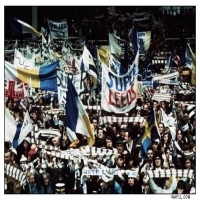 This was only the first season back in the top flight for Leeds United and Don Revie's third season in charge. Leeds had aleady finished joint top of the division with Manchester United but were beaten to the title on goal difference only. The FA Cup proved to be just as close as the game went to extra time for the first time since 1947. Leeds lost the game 2-1 with Billy Bremner scoring the Leeds goal in the first period of extra time. This was also the first FA Cup Final to feature a black player, Albert Johanneson the left winger for United.